When and why did you first become interested in gymnastics? When my older sister began gymnastics, I wanted to follow in her footsteps. I’ve always looked up to her inside and outside of gymnastics. Do you have any good/funny memories from when you first started taking gymnastics classes? When I first started taking gymnastics lessons, my arms/legs were all over the place, so my mom would call me “loosey goosey”. 9. When did you decide you wanted to compete? And, when did you want to compete at a high level? What about competition appeals to you? I have always enjoyed competing. I remember watching gymnastic on TV, and thinking that one day it would be me. Competition gives me the opportunity to perform the skills that I train so hard to perfect. What is your training regimen? As a level 10, I train six days a week for 4 – 5 hours per day. Was that a big change when you made the switch to competitive gymnastics? Yes, the number of hours at the gym increased a lot. What is your favorite skill? Double layout dismount from the bars. Who is your favorite gymnast or who is your “idol”? 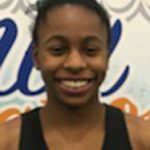 My favorite gymnast is Dominique Dawes, “Awesome Dawesome”. When I was younger, my sister and I would listen to her motivational speeches and watch her perform on YouTube. How have you grown as a gymnast during your career, both skill wise and mentally? When I was a young gymnast, I would focus on competing against my opponents. Today, I focus on competing against myself. How has gymnastics helped you as a person? As a person, gymnastics has helped me apply the same work ethics I use in training to my schoolwork. Currently, I have a 4.45 grade point average as a junior in high school. If you had to select one life-lesson that gymnastics has taught you, what would it be? The one life-lesson that gymnastics has taught me is “never give up” on your goals. Practice truly makes perfect. What grade are you in school? I am in the 11th grade. Do you want to compete in collegiate gymnastics? Definitely! What are your favorite subjects, etc.? Math and Science. If you plan to go to college, do you know what you want to study there? In college, I plan on studying Biomedical Engineering with an emphasis in prosthetics. What are your goals for the future, both as an athlete and after you are finished competing? My goal is to become a collegiate gymnast. While in college, I plan on majoring in Biomedical Engineering. When you’re not in the gym, how do you enjoy spending your time? Do you have any hobbies or favorite activities? When I’m not in the gym, I like to catch-up with my family. Normally, we go to a movie, a favorite restaurant, or to the beach. Do you have any competition rituals? My Family Prays before each competition. What’s on your IPod right now? Khalid. What type of music do enjoy listening to? Pop. If you had to pick 3 words to describe yourself as a gymnast, what are they? Focused, Hardworking, and Determined.